FRP retrofit technology has been introduced in the civil engineering area in the recent decades. For structural applications, FRP is mainly used in two areas. The first area involves the use of FRP bars instead of steel reinforcing bars or pre-stressing strands in concrete structures. The other application is to retrofit structurally deficient structural members with external application of FRP. 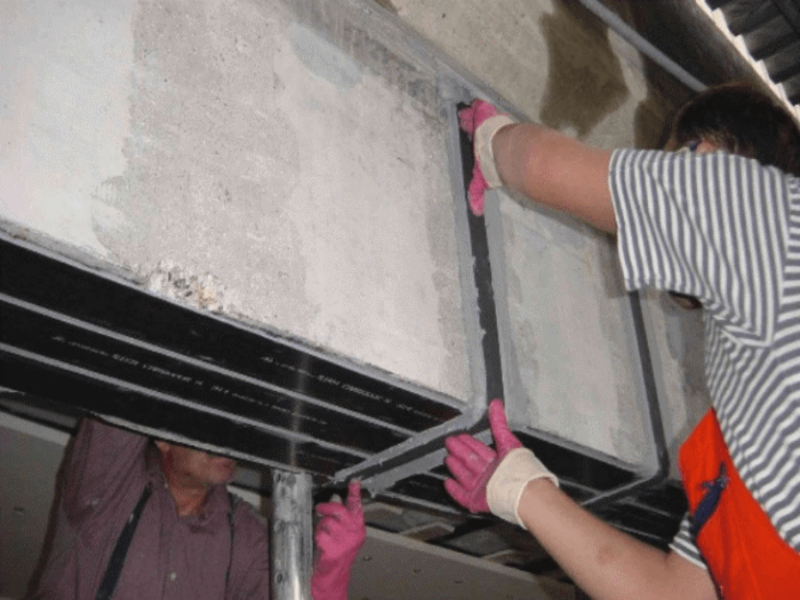 FRP can be bonded to reinforced concrete structural elements using various techniques such as external bonding, wrapping and near surface mounting. FRP plates or sheets may be glued to the tension side of a structural member to provide flexural strength or glued to the web side of a beam to provide shear strength. FRP sheets can also be wrapped around a beam to provide shear strength and be wrapped around a column to provide confinement and thus increase the strength and ductility. Near surface mounting consists of sawing a longitudinal groove in a concrete member, applying a bonding material in the groove and inserting an FRP bar or strip. Recently, FRP has started to be used to increase the flexural strength of members. To increase flexural capacity, the FRP should be glued to the member in the way that fibers are parallel to the direction of the principal stress. FRP plates have been proved to increase the stiffness of the member and the load capacity, and reduce the cracking. The deflection of a retrofitted beam is considerably smaller than that of an un-retrofitted. This is due to the fact that stiffness is added to the member by the FRP plate or sheet. Moreover, the number of FRP sheet layers has considerable effect on the ultimate load and stiffness of a beam. The load carrying capacity was shown to increase with an increased number of layers of carbon fiber sheets for up to six sheets. The initial load at the time of strengthening is also an important factor that affects the ultimate strength of RC beams strengthened with FRP. A beam strengthened at a higher level of load will produce a lower ultimate strength than a beam strengthened at a lower level of load. It is also possible to apply FRP on continuous beams, either in the negative moment or positive moment zone. The use of FRP laminates to strengthen continuous beams is effective for reducing deflections and for 14 increasing their load carrying capacity. In the past decade, beams retrofitted for increased shear strength has attracted scientific attention. Shear strengthening is usually provided by bonding external FRP reinforcement on the sides of the beam with the fiber direction perpendicular to the beam axis or with an angle corresponding to the principal stress direction. The modes of failure and gain in the ultimate strength depend on the orientation of the FRP. Using inclined FRP strips can result in increased shear strength and stiffness with substantial reduction in the shear cracking. U-wrap, with FRP also in the flexural region, is the most effective configuration with respect to load capacity. Using U-wrap with FRP in the flexural region, both the shear and the flexural capacity increase and this may also prevent brittle failure. The shear capacity is also dependent upon steel stirrup spacing and amount and distribution of FRP.